Posted on December 5, 2017 - By Fucosoft | Follow YouTube, Twitter to Get More Information. 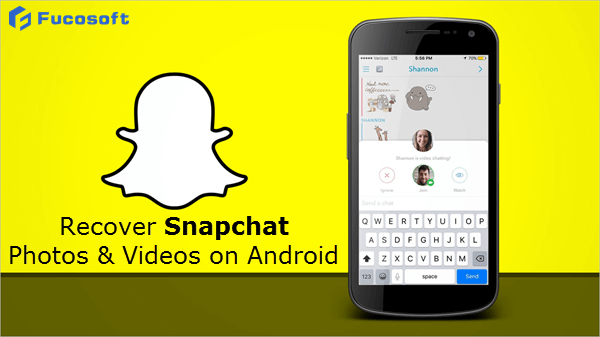 Snapchat now is one of the most popular social networking apps for both Android and iOS users. There are a lot of people, especially teenagers and young adults, love its self-destruct feature. The only way you can save Snapchat photos is taking a screenshot or using third-party app. But what if you want to view old/expired Snapchats before you had the chance to save them? In a previous post, we’ve discussed how to recover Snapchat photos on iPhone. If you’re using Snapchat on Android, just follow this article and find effective methods to recover/save Snapchat photos and videos on Android devices. Even though Snapchat claims that all pictures/videos are deleted upon being viewed by recipient. Actually, the old/expired Snapchat photos or videos are still kept in a cache folder on your Android phone. All received files end in .nomedia, an extension that makes them “invisible”. You can navigate to the cache file folder and find all your received Snapchat photos/videos there: com.snapchat.android > cache > receive_image_snaps. If you’ve recently emptied the cache of your temporary files, or unable to find old snaps in the cache folder, a piece of Snapchat recovery tool may help. Fucosoft Android Data Recovery software is able to recover deleted Snapchat photos and videos on Android devices, including Samsung Galaxy S9/Note 9, HTC U12+, Huawei Mate 20 Pro, Google Pixel 3 XL, LG G7, OnePlus 6T, Sony, Moto, Xiaomi, Oppo, etc. Also, this program supports to recover deleted Android photos and videos, contacts, call logs, text messages, WhatsApp, Viber and more data. Step 1. Install the Android Snapchat Recovery on your computer and run it. Connect your Android phone to PC via USB cable. Step 2. Once your Android phone is detected by the program, choose the type of files you’d like to restore and click “Next” to begin analyzing and scanning your device. Step 3. After that, you can preview all recoverable files one by one, then check the items that you want and click “Recover” to save Snapchat photos/videos to computer. Open Snapchat in your Android phone and select the “Stories” icon to enter to your Stories screen. Tap on the download icon to the right of “My Store” to save your entire story. If you only want to save one Snap, tap the three vertical dots icon and choose the snap you want, then tap on the download button in the bottom-right corner to save it.